Automatic Sewing Awl by C.S. Osborne. Automatic Sewing Awl, Manufactured by C.S. Osborne. 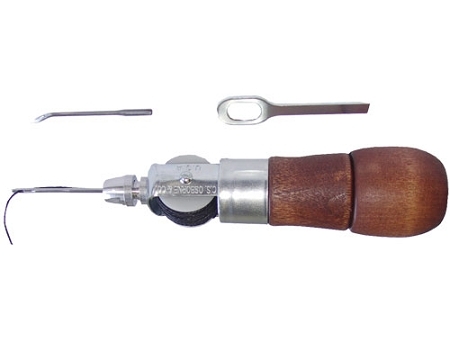 An excellent tool for sewing leather and canvas. The awl carries a spool of waxed polyester black thread. The hollow handle contains straight needle and extra curved needle plus a small wrench to tighten the needle. Directions for use are also with the tool and explain how a lockstitch can be effected with this sewing awl. The Awl also comes with a reel of black thread. Extra needles and threads are available. Brown and White thread on reels sold separately.